At the moment, the situation is without precedent. All the rules are broken. The Corps normally operates the dams on the basis that anything over 4,000 cubic feet per second (cfs) as measured by this Piney Point gauge is going to flood property downstream. On the morning of Friday, Aug. 25, rain began to fall in Houston as Hurricane Harvey approached the lower Texas coast. The floodgates on the dams were closed, though rainwater and runoff would still flow freely from the west and the north around the reservoirs through the Clodine and Barker ditches and Turkey Creek and empty into the bayou right below the dams. A modest rain fell, heavier around Pearland. Some Houstonians grew skeptical, doubting the power of the storm. Others worried and watched the weather reports with alarm. That evening Harvey smashed into Copano Bay near Rockport and Port Aransas, breaking up houses and blowing heavy trucks off the road. The rain in Houston continued. The flow at Piney Point shot above 4,000 cfs on the evening of Saturday, August 26. 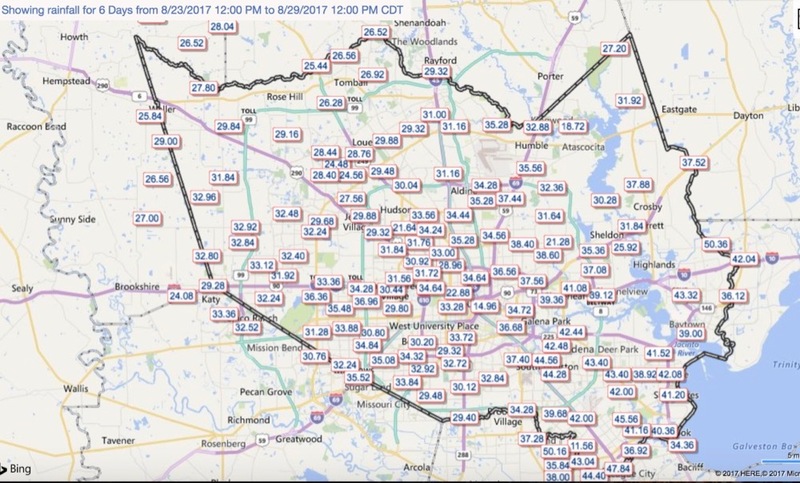 And the rain continued and grew heavier, dropping 10 to 17 inches all over Houston, up to 20-26 inches on east Harris County. By Sunday evening, Aug. 27, the tide gauge on Buffalo Bayou at Manchester on the east side of town was nearly nine feet, setting a record. Buffalo Bayou is tidal to just upstream of the Shepherd Bridge. Homes on Buffalo Bayou from Shepherd to the dams and beyond began to flood, though in some cases streets flooded first and poured into houses. Despite our vaunted flatness, land naturally drains towards a river, even paved land, only faster. When the rivers are full, and in the case of Buffalo Bayou and its tributaries, blocked by an usually high tide, the drainage system, natural and built, backs up too. Buffalo Bayou is the main river running through the center of Houston, and most other bayous and streams drain into it. In the early morning hours of Monday, Aug. 28, concerned about the rapid rise in the level of the reservoirs, the Corps began releasing 1,600 cfs of Harvey storm water from the dams into Buffalo Bayou, increasing within a few hours to 8,000 cfs. At the time, with the floodgates closed, the flow was already well above 10,000 cfs just from rain and runoff below the dams. This was the first time water had been released from the dams during a storm. It was an extraordinary measure to fight against the exceptionally high and fast-rising level of storm water entering the normally empty reservoir pools. Accumulated rainfall in Harris County from Hurricane Harvey, August 23 to August 29, 2017. Image from the Harris County Flood Warning System. By Tuesday afternoon, Aug. 29, Harvey had dropped a record of some 51 inches of rain on southeast Houston with most parts of the region receiving more than 30-40 inches of rain. And for the first time ever, despite releases from the reservoirs, impounded stormwater was spilling around the low concrete end of Addicks Dam on the north. 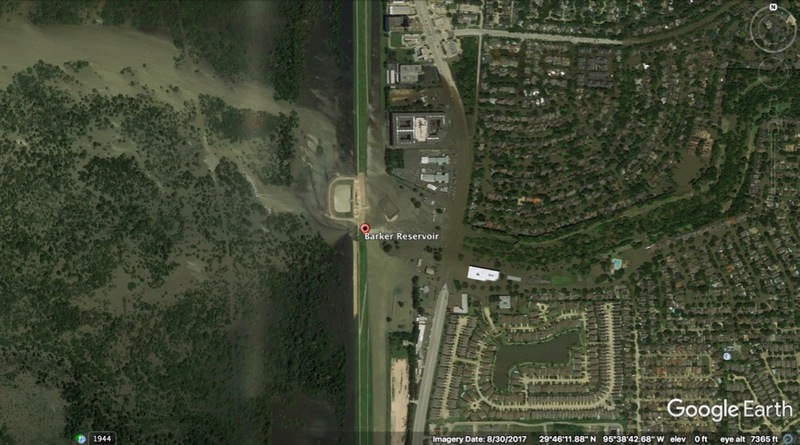 This was by design, in order to avoid overtopping the long, horseshoe-shaped earthen levee. The Corps reported on Facebook Saturday that on Friday evening the spilling had stopped, and all water was flowing through the floodgates as planned. Receiving a text or email from the USGS that the flow was exceeding 4,000 cfs at Piney Point might have helped people prepare. Here is a link to the webpage that allows you to set that up. The link to subscribe to WaterAlert is near the bottom of the page below the graph of gauge height. You can also receive alerts when the flow in the bayou drops below a certain level. Below 4,000 cfs, for instance. People living upstream of Piney Point might want to choose a different gauge, say the gauge at Beltway 8. There are also alerts for gauges on other bayous, like Brays. Shoot. Here is a link to USGS streamflow and water conditions for all of Texas. You can choose what stream and what information you’d like to know about, get Twitter alerts, and more. It seemed like the rain would never stop. But on Wednesday, Aug. 30, the rain finally went away. But the releases of storm water from the reservoirs continued, reaching a combined volume of more than 13,000 cfs. On Sunday, Sept. 3, the Corps announced that releases from the dams would be gradually reduced but would continue until Sept. 15 and possibly longer if it rains again. On Monday around noon the Corps was still releasing about 7000 cfs from Addicks reservoir and from Barker about approximately 6300 cfs. USGS Streamflow for all Texas Rivers grouped by river basin. Most Houston area streams are in the San Jacinto River Basin. Projected inundation on upper Buffalo Bayou for Sept. 7, 2017. Image from the USACE Galveston District.